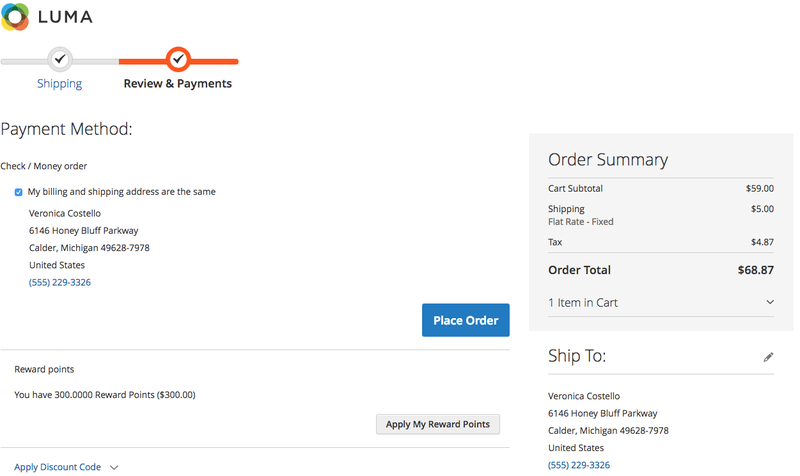 Magento 2 Reward Points allows the store owner to add and manage customers credit funds so that they can make purchases using the reward points. These reward points can get added to the customer account balance (i.e., for completing such actions as placing an order, leaving a review or subscribing for newsletters), as well as assigned to it on special occasions (i.e.birthdays). Additional conditions can be applied so that the customer gains a reward only if they are met. number of points for a specific amount/qty of items starting with a certain amount/qty. 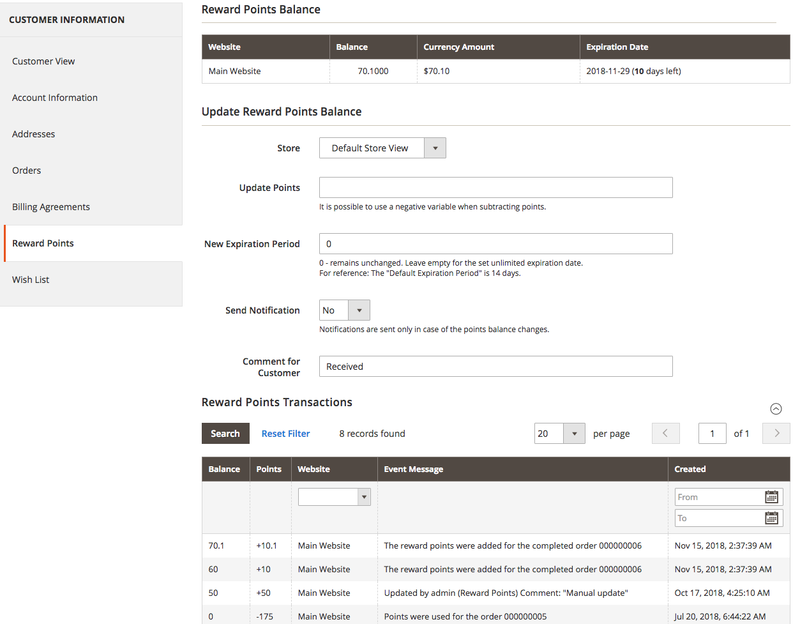 The customers can check their reward points balance in the special tab of their customer account. These points can be easily applied or canceled during the checkout. Reward Points supports both Community and Enterprise edition of Magento starting from version 2.2. The current version of Magento installed on your website can be found in the lower right corner of any backend page. Reward Points extension has 2 separate ways of installation: via Composer or by copying the code. 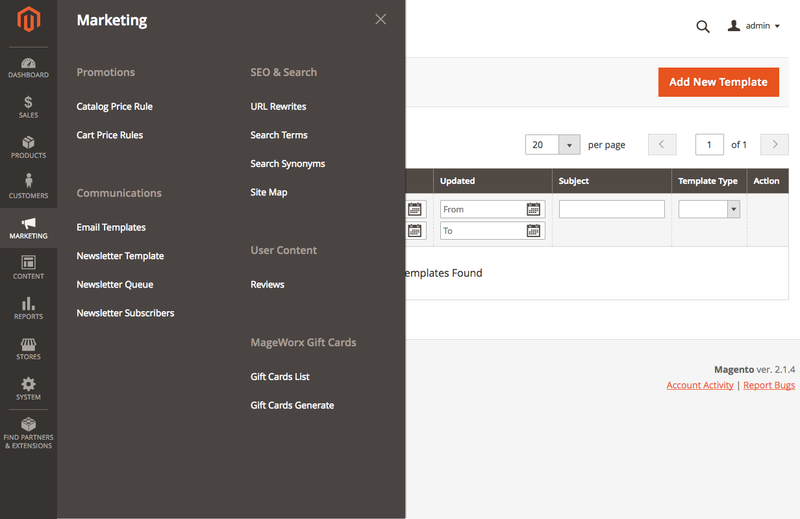 Log into the Magento Admin panel and go to STORES ⟶ Configuration ⟶ MAGEWORX ⟶ Reward Points. The extension configuration has 3 tabs: Main Settings, Expiration Date Settings and Email Settings. The Enable setting provides the possibility to temporary disable/re-enable the extension functionality from the backend. Static Block for "My Reward Points" Section sets a selected static block to be shown at My Reward Points tab in the customer’s account. It supports all the blocks that are shown on the CONTENT ⟶ Elements ⟶ Blocks grid. Cover with the points allows applying credits to an order’s subtotal and/or shipping and/or tax. The system analyses this selection and applies credits to what is chosen. For example, if the store owner doesn't want to allow customers to pay shipping costs using credits, you need to remove the selection ‘Shipping & Handling’. Thus, customers will need to pay for shipping using other payment methods. Points Exchange Rate provides the possibility to change the cost of 1 Reward Point in the Website Base Currency. 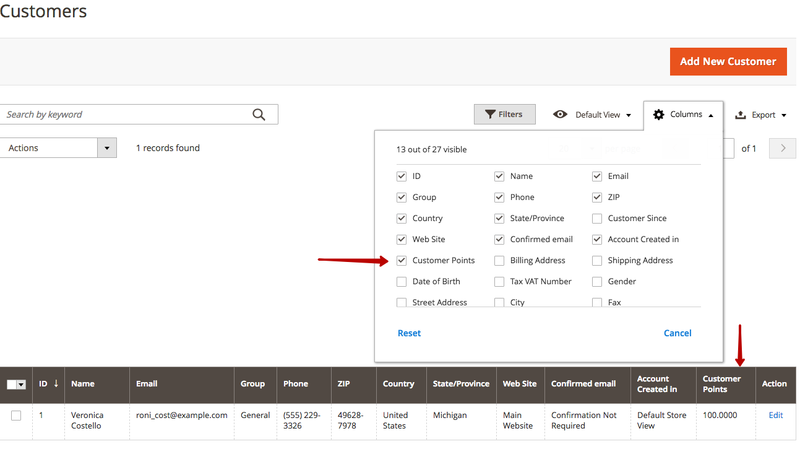 Assign to Customer Groups sets customer credit functionality to the selected customer groups. If not selected, the customers won’t be able to use internal credits. The next section of the extension's configuration provides the setup for the messages that will be visible for the customers in the header of the website and in the minicart popup. If the Display Points Message setting is enabled, the text will appear in the header of the webpage. This message can be changed in the Points Message field. The following variables are available: [p] displays the number of points the customer will receive after completing an order; [c] displays the reward value expressed in the store currency. Display Mini-cart Points Balance Message adds the message to the minicart popup. This message is shown if the customer has the reward points in the account. The text can be changed in the Mini-cart Balance Message field. Same variables can be used here as well. This message is shown if the customer doesn't have the reward points in the account. The text can be changed in the "Zero Balance" Message for Mini-cart field. If the Annul the received points upon the full order refund is enabled, the reward points will be removed from the customer account in case they were applied to the order that was refunded afterward. 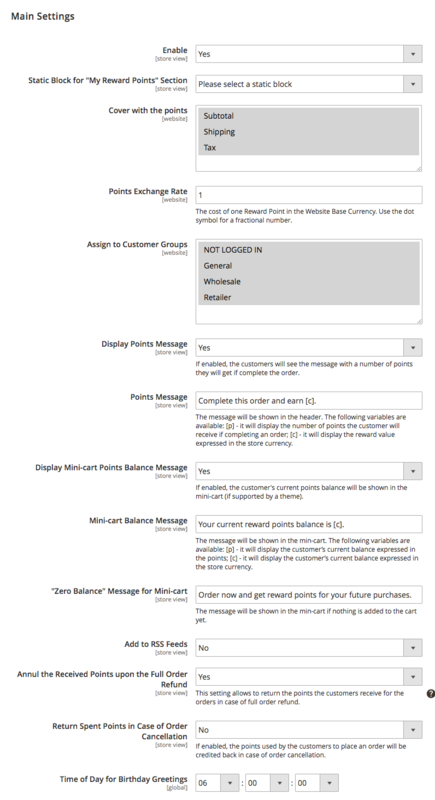 The Return Spent Points in Case of Order Cancellation configuration makes it possible to return the points the customers received for the orders if the order has been cancelled. The Time of Day for Birthday Greetings specifies the time when the reward points will be added on the customer’s birthday. If Enabled, these settings provide the possibility to give the rewards points the expiration period. 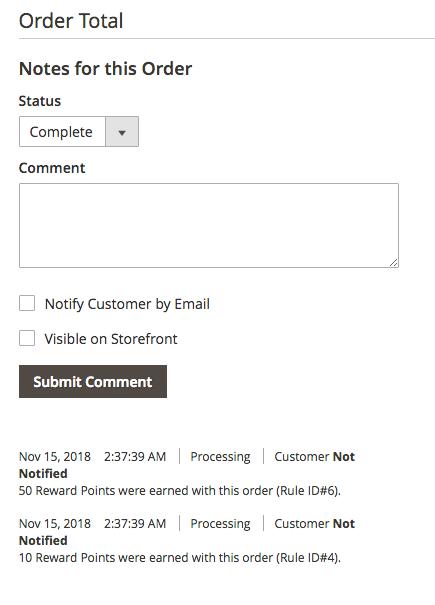 The store owner may change this time interval by giving the number of days for the rewards points in the Default Expiration Period configuration block. The situation when the store owner decides to change or enable the expiration date settings is quite possible. The logic of such store points management is configured in the Update Existing Expiration Dates setting. If No is selected, the customers with both expired and not expired balances the new expiration period won't change. It will be changed for them only in case some new reward points will be added to their account. If For balances if expiration date exists setting is selected, this new expiration period will be changed only for those customers who have some points available with the expiration date set in their customer account. All of them will be able to use their points during the time interval that was defined in the Default Expiration Period setting. If For all balances setting is selected, this new expiration period will be changed for all the customers, even for those that don’t have the expiration date set in future in their customer account. The Send Expiration Date Email setting allows sending the emails about the approaching expiration date. The number of days to send the messages before the actual expiration can be setup in the Notify Customers about Expiration Date configuration. Click the Add New Template button. 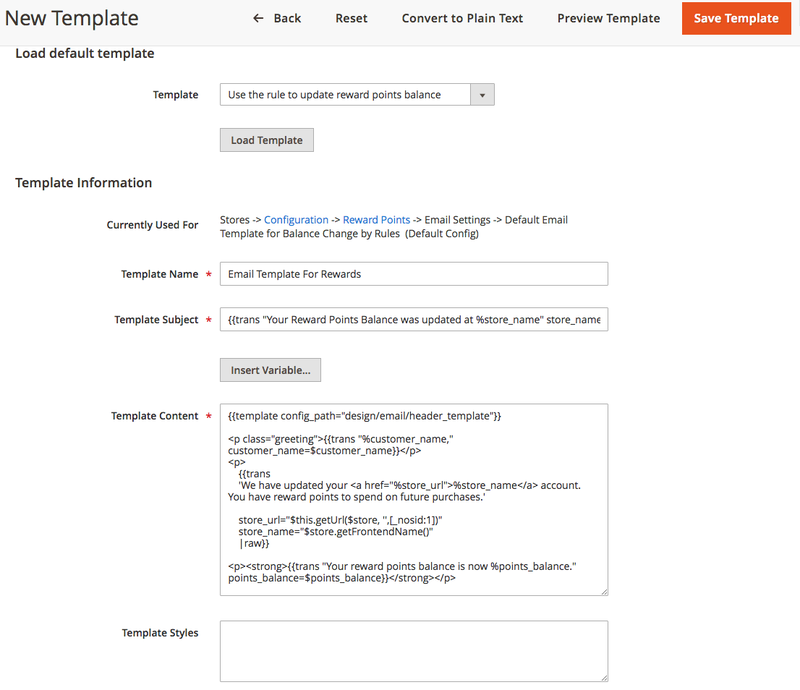 In the Template dropdown, select the desired template and click the Load Template button. Edit the Template Content and preview the changes by the Preview Template button at the top of the page. Once the template is saved, it will be visible in the Templates Dropdown. 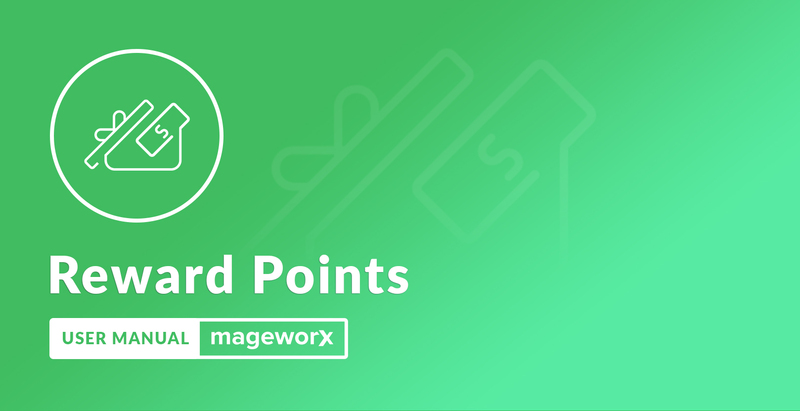 To add, delete or modify the Reward Points rules, log into the Magento Admin panel and go to MARKETING ⟶ MageWorx Reward Points ⟶ Rules. To create a new reward points rule click the Add New Rule button. The rule configuration consists of 4 sections. Rule Name allows you to assign a unique name to the created rule. 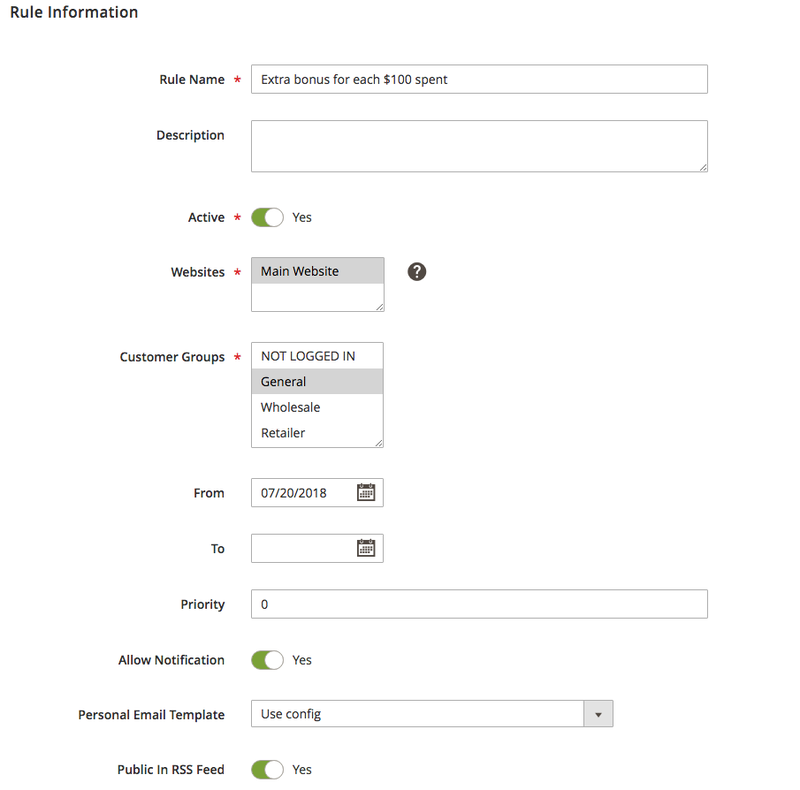 The Description field provides the possibility to add the rule decription. It will be visible only in the back-end. The store owner can temporarily disable or re-enable the rule using the Active toggle. The Websites setting specifies the website where the rule should be applied to. The Customer Groups configuration allows applying the rule to the specific customer groups only. The store owner can restrict the usage of the rule by date intervals using the From and To date pickers. If several rules can be applied and their priority needs to be handled, it can be managed by the Priority setting. The bigger the value, the higher the rule will be in the order of priority. If Allow Notification is enabled, then the email will be sent to the customer when the reward points are credited to the balance. Personal Email Template adds the possibility to use the template that meets exactly this particular rule. If the Use Config setting is selected, the one in the extension configuration will be picked. The extension supports several events, such as placing an order, leaving a review, subscribing for newsletters or in case of the client's birthday. The last 3 settings provide the possibility to credit the X Points when the condition is met. The order placing configuration is more complicated and needs to be explained. If the Placed Order event is selected, the Give Points setting shows. It can be further configured depending on the desired condition. The Get X Points setting allows crediting the specific (X) number of reward points to any order. The Get X Points for every Y spent credits the specific (X) number of reward points to the order that is bigger than Y threshold. So, for instance, the X is set to 10 and Y to 50. If the grand total is $49, then the customer doesn't receive any reward points, for the grand total $52 the customer receives 10 reward points. The customer gets 10 points as well if the grand total is $99. 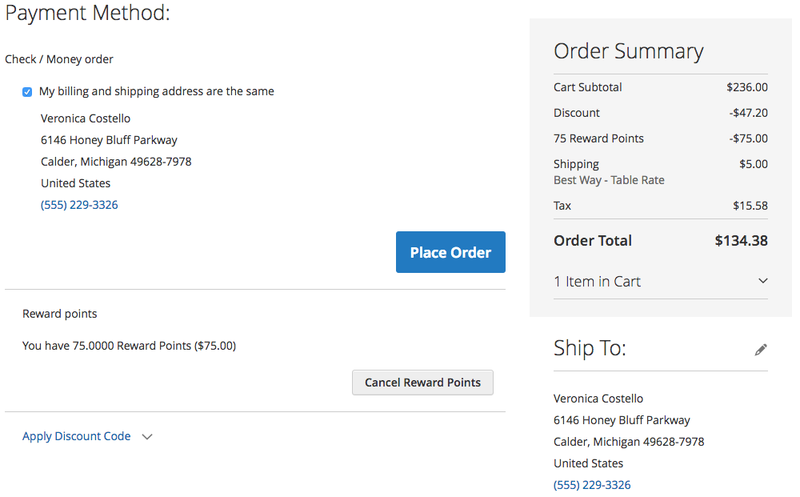 For $101, the customer receives 20 reward points, and so on. The Get X Points for every Y spent starting from Z spent credits the specific (X) number of reward points to the order that is bigger than Z threshold for every Y sum. So, for instance, the X is set to 10, Y to 20 and Z to 100. If the grand total is &#36;99, then the customer won't receive the reward points as it is smaller than Z ($100). If the total is $119, then the customer won't receive the reward points as well, because 10 points are credited for every $20 starting from $100 and $119 is less then $120. If the total is $139, then 10 reward points will be credited to the account. 20 reward points will be added for the $141 grand total, and so on. The Get X Points for every Y quantity credits the specific (X) number of reward points to the order that has more than Y products in sum. So, for instance, the X is set to 10 and Y to 5. If the customer buys 3 T-shirts and 1 bag, then no reward points will be added as the total quantity 4 is less than Y. If the customer buys 5 T-shirts and 4 bags, then 10 reward points will be added (total quantity is 9). For the order with 7 T-shirts, 3 bags and one pencil 20 points will be added (total quantity is 11). The Get X Points for every Y quantity starting from Z quantity credits the specific (X) number of reward points to the order that has more products than Z threshold for every Y products. So, for instance, the X is set to 10, Y to 5 and Z to 10. If the customer buys 4 T-shirts and 5 bags, then no reward points will be added as the total quantity 9 is less than Z (10). If the customer buys 4 T-shirts, 5 bags and 5 pencils, then the customer won't receive the reward points as well, because 10 points are added for every 5 products starting from 10 and the total quantity (14) is less than 15. If the customer purchases 16 products in total, then 10 reward points will be added to the account. 20 reward points will be added for the 21 products in total, and so on. The Placed order event shows the additional field, the Calculation Type so that the quantity of reward points can be calculated as the fixed value or as the percent of the grand total. The last, Discard subsequent rules configuration stops any other reward points rules from being processed in case several rules conditions are met. This section limits the products from the whole cart that should be counted. If you have several products in the cart, and only one meets these conditions, it will be handled as if it had been the only one in the cart. If the action conditions are empty, the price will be calculated from the grand total (no rules = no limitations). If the action conditions exist and don't include the valid items, the rule will be ignored and not shown at all. The statement has two bold links (ALL and TRUE - see above), which, when clicked on, suggest the list of options for the chosen statement part. Tap the ALL link, to choose between ALL or ANY. Tap the TRUE link and choose either TRUE or FALSE. If you save the condition without making additional selections, the rule applies to all products. The selected condition appears in the statement, followed by two more bold links. Click is to select the desired condition and the ellipsis (three dots) to specify the end of the condition. To add another line to the statement, tap the Add button one more time and repeat the process until the condition is complete. If at any time you want to delete a part of the statement, tap the Delete button at the end of the line. This workspace has the same structure and logic as the previosely described Actions section. The difference is that these condition limits the whole card so that if the condition is true, the reward point rule will be met. After that the extension will check the valid products (if any) from the Actions tab. Otherwise, the rule will be ignored and not shown at all. Some conditions can be left blank. This makes the whole condition false. For better understanding, please check our quick cheat sheet for the Reward Points rules. The Labels Section is designed for different frontend names of the reward points rule on different store views. Some rules may need to be translated and, for this matter, this section allows specifying the appropriate name. Please note that if the string is empty, the Default Rule Label for All Store Views will be used. The extension is implemented into the base Magento backend workspaces extending the standard functionality. If the customer purchases some products using the reward points, this information is available on the order totals block. This feature provides the possibility to detect whether the reward points were used for this order or not. 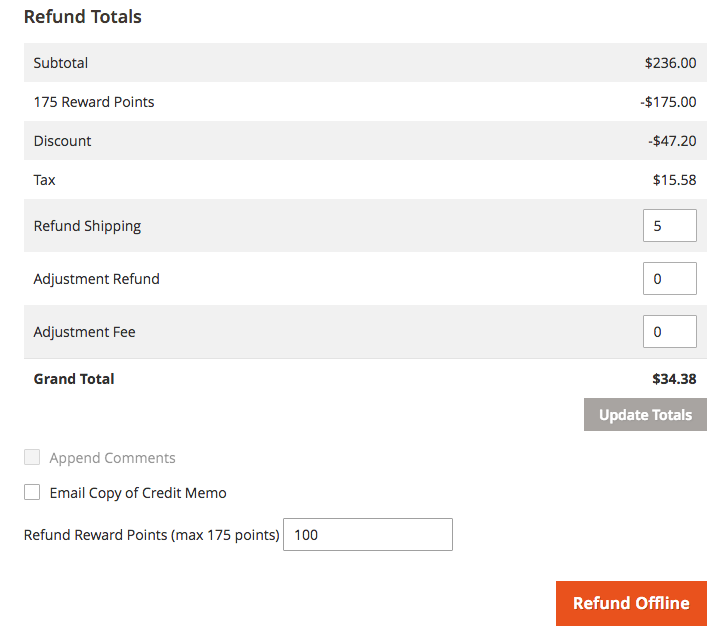 If the store owner wishes to give the reward points back for the refunded order where the points had been used, it can be done on the refund totals block on the credit memo page. 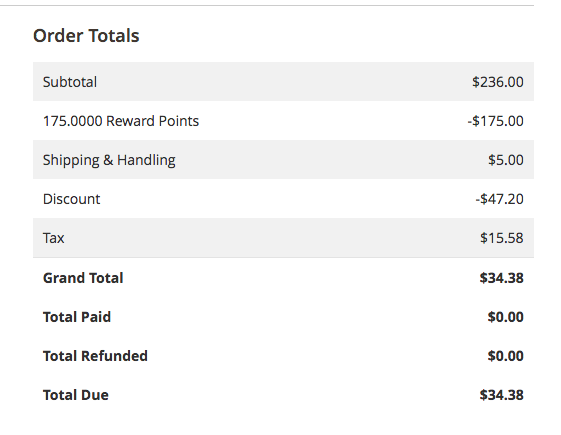 The max value for the refunded reward points equals the quantity of the points spent when this order was made. Select the customer whose balance you need to edit. The customer reward points are shown on the special Reward Points tab. The workspace consists of three tabs. This tab shows the grid with the customer's reward point balance on any website within one Magento installation. If the expiration period has been enabled, it will be shown here as well. This tab provides the possibility to manually credit or deduct the reward points. The Store configuration provides the possibility to add the points to the customer in the specific store view. The Update Points supports both positive (to credit) and negative (to deduct) values. The store owner can specify the New Expiration Period. Please note that in case the customer already has some available reward points (both without and with the expiration date set), the new period will be applied to them as well. 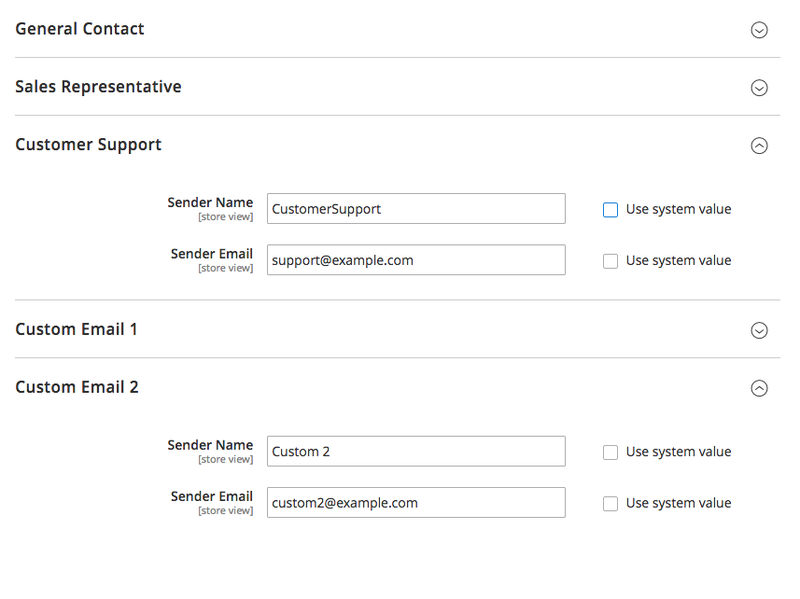 If the Send Notification is set to Yes, the customer receives the email with the default email template. The Comment for Customer allows the store owner to write some particular text for the customer to be visible in the customer account. This tab shows the grid with the customer's reward points transactions history. 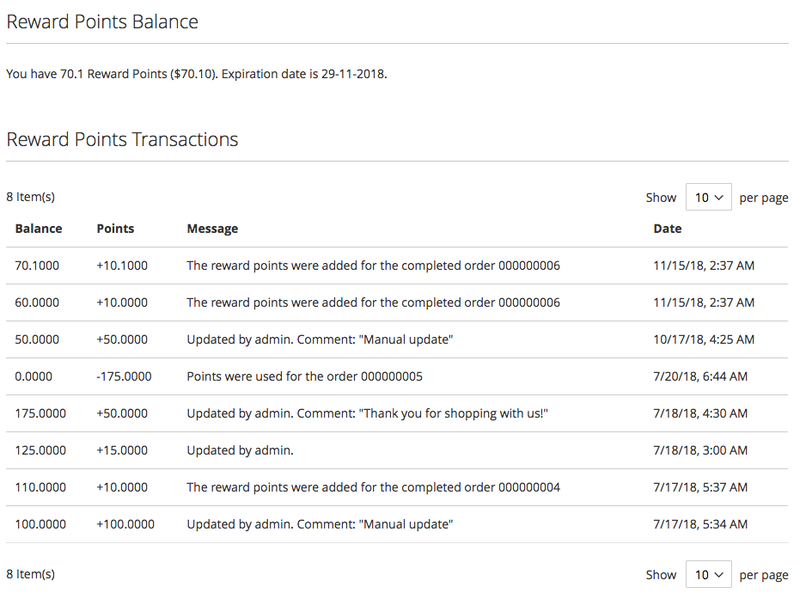 To observe the full log of the transactions made by your customers, log into the Magento Admin panel and go to MARKETING ⟶ MageWorx Reward Points ⟶ Point Transaction. 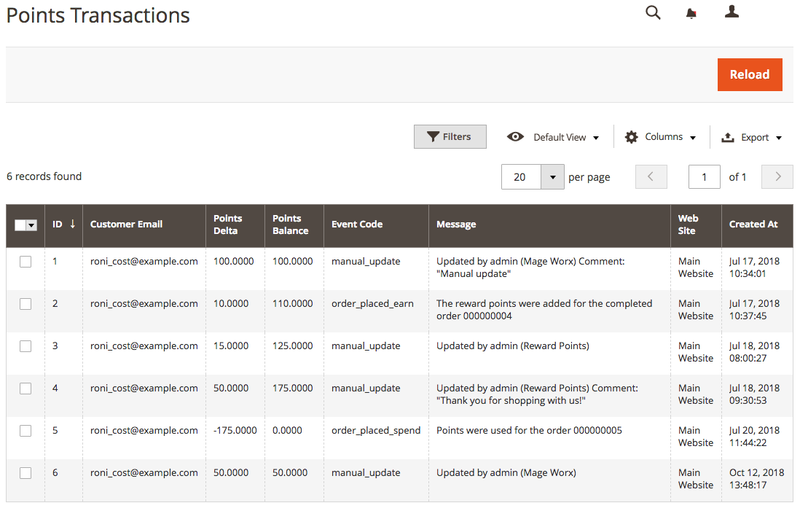 Log into the Magento Admin panel and go to SYSTEM ⟶ Data Transfer ⟶ Import/Export Reward Points. "Website Code","Customer Email","Points","Action","Comment for Customer (not required)"
"base","[email protected]","20","replace","Hello! Your balance now is 20 points"
"base","[email protected]","10","add","Hello! 10 points were added to your balance"
"base","[email protected]","5","deduct","Hello! 5 points were deducted from your balance"
The action column manages the balance change. For instance, assume that the original balance is 100 and the value of the number points is 25. The deduct subtracts it (100-25)=75. If the deduct value is bigger then the original one, the final value will stay 0. The extension is implemented into the base Magento frontend workspaces extending the standard functionality. 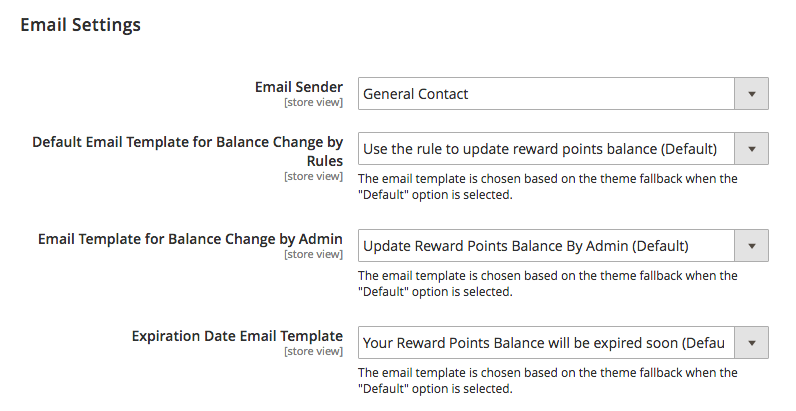 The customer reward points are shown on the special Reward Points tab on the customer information page. Here, the customer can observe the exact quantity of the reward points and the reward point transactions history. The expiration date, if enabled, is shown here as well. The comment for сustomer from the backend is shown in the Message column. The extension shows the Reward Points block on the checkout with the possibility to apply them to get the discount. The customer can cancel the usage of the reward points usage if necessary. If the customer doesn't have any reward points at all, this block will be hidden. We've made the special quick guide for the reward points rules to understand them better. Please, check it here.